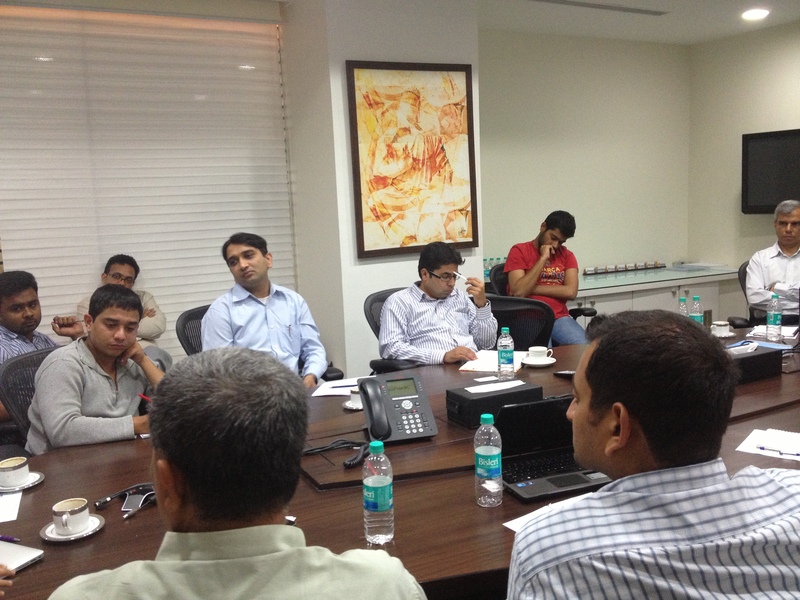 iSPIRT ProductNation Branding RoundTable: Why Product Branding is important for Startups? As usual, the 16th iSPIRT RoundTable was a great learning experience. Many thanks to Avinash Raghava & iSPIRT for conceptualizing it, and to Helion Ventures for sponsoring the venue and the snacks. Dhruv Shenoy of Knowience Consulting, a well-known Marketing Guru, was the facilitator, along with Rajan from Intuit. Thanks, Dhruv and Rajan, for an educational and entertaining session. I used to think that product branding is only for large companies and startups and early stage companies don’t need to worry about it. So I was skeptical at first – but I trusted Avinash’s judgment in putting together this session. And it was an eye-opener. Dhruv explained to us what “brand” is and why it is important for products at any stage of maturity. Building the product without doing an exercise in defining the brand can lead to lot of wasted time and money. Branding consists of three high level activities “What to say”, “How to say” and “How do we reach the target customer”. This round table focused on “What to say”. Future round tables will cover the other two high level activities. Starting with the definition of “Brand”, we covered “Customer Insights”, “Product Proposition”, “Target Audience”, “The Six Tenets of Product Branding”, “Brand Essence” and “Brand Positioning Statement”. After reading this article, give a shot at creating a Brand Positioning Statement for your product. From my personal experience, I assure you that it is time well spent. We normally look at only commercial products, but the concept is broader. Mother Teresa, Lord Ganesha, Santa Claus are also brands. So are Diwali and Valentines’ day. Or even the concept of “Brand India”. Most Unique (not overlapping with others). For example, among the 33 Crores of Hindu Gods, which God is known for removing obstacles and hence needs to be worshipped first? Everyone knows it is Ganesha. Ganesha satisfies all the three conditions above. Brand is how consumers identify the product and recall it. Brand is built over a period of time by the consumers/target audience. The manufacturers can do brand building activities keeping the above three attributes in mind. Brand building takes time. For example, Gmail built it over several years to overtake Yahoo. To be successful, the product should not be a commodity. It should be a brand. For example, rice is a commodity and is talked in terms of Rs. 43/kg or Rs 50/kg. But Kohinoor Basmati is a brand. A brand kindles attributes about the product in the mind of the consumer. Brand creates a promise. This needs to be delivered by the product. Otherwise, it will backfire badly. So how do we go about creating a brand for our product? The first step is to get customer insights. It is very important to realize that there are thousands of things going on in the customer’s mind. How do we get into the mind of the customer and grab mindshare? Even if you have a great product, if the customer cannot identify and recall it, you have lost the customer. To understand how to get the customer’s mindshare, we need to get customer insights. Customer insights are at a deeper level and not just at the level of product benefits/features. These deeper insights should be used to differentiate your product and get the customer’s mindshare. SalesForce: Before SalesForce, companies had to make large investments in Software and have it installed and maintained on premise. This was keeping SMEs away from expensive Software. They could not afford to make such investments to see value. Subscription based, on-cloud service appeals to this customer segment. SalesForce targeted this customer insight. Dove: As women get into early 30s, they have the insecurity that they are looking older. Dove promises that they will look younger. LinkedIn: Man is a social animal and wants to keep in touch with his contacts. In the offline world, the mindshare of friends (whom you meet at home in a relaxed environment) is different from mindshare of professional contacts (whom you meet in a coffee shop with some agenda). LinkedIn’s insight was that what you do offline (meeting people, networking etc), you can do online also in a separate way. Online life mirrors real life. Instagram: People want to look like professional photographers. People are taking photos from their mobiles and sharing, but the photos were not looking professional. Instagram lets you do that from your mobile. Scooty: Kinetic Honda is very heavy for young girls. They need something lighter without gears. Gmail: Other mail providers were limiting the max space. Gmail came up with 10GB space. Focus on only one thing from the customer mindshare point of view. Which part of the customer’s problem are we solving? Focus on the deeper benefit. David Ogilvy said “Interrogate your product till it confesses its strengths”. What can my product do that others can’t? Without this, your brand will not have recall value. If we have multiple product lines, then we should have a main mother brand (e.g. Microsoft) and the sub brands for individual product lines (e.g. MS Office). Study the market dynamics and focus on customer insights. Customer Insights should be the foundation of business planning. Remember that customer attitudes are never static. Customer insights are the key to building a discriminator. How do we go about getting customer insights? Usage. This is the best way – find out how the customer is using your product and take feedback. Observation. For example: shopping insights, product usage analytics, surveys, research. Probe. Ask open ended and close ended questions and analyze responses. The best way to get consumer insights is to go back to the people who are using your product and find out why they are using it. This will also give you insights on your product differentiation. Ask customer to describe your product. It can illuminate you on what you think your customer thinks (apologies for the thought twister). Once you’ve got the customer insights, the next step is figure out which insight you want to target. And that brings us to “Product Proposition”. How will my product be different with respect to the competition? Filters down from consumer insights. Discrimination starts with the product. Brand builds on product promise. iPod: iTunes + iPod. Buy one song instead of an album. Biggest storage capacity. Nissan Sunny: More legroom for people sitting in the back seat. Longer car in the same category (i.e. at Sedan cost). Google: With earlier search engines, you had to think what to type. Google addressed this with “Search the way you think”. Flipkart: Hassle free delivery. Very fast. Maruti Car: How much mileage? Value for money. It is very important to be unique on some dimension – even from the day you conceptualize the product. And, the product proposition has to be very simple to have recall in the customer’s mind. One rule of thumb is to aim to explain your product to your child/grandmother. Typically, this can be done. Think of what is keeping your customers awake at night. And use that to grab the customer’s mindshare. For example, let’s take my company’s product – KeyMails – which solves the problem of email overload for Microsoft Outlook users. The insight could be that the target customer is worried about missing an important mail. So, something like “Never miss an important mail” could be one approach to branding. Think in terms of “Unique Atomic Unit” about your differentiator. For example, with facebook it is “update status”; with twitter, it is “very short message”. Spend some time thinking about what the unique atomic unit is for your product. Do it now. Go to market with the differentiating “hero” feature. Other features are needed, but they do not form part of go to market strategy. Example, Scooty is a vehicle that has good mileage and a good engine, but they focus on their differentiating factor of being usable by girls. Once you have the product proposition, the next step is to understand the target audience. Why should we understand the target audience? Who are we talking to? And why? What are his/her attitudes to the category? For example, for Naukri, the recruiter thinks he needs their service if he needs to hire 200 people in a month. If it is just for one or two positions, consultants might work better. This customer attitude is important to know. Online recruitment is for scaling. You need to create a persona for the target customer. In the initial stages of a startup, it is better to have only one target persona. Having multiple target personas causes confusion. Pick the persona that is most promising. The persona needs to change and be refined as you get more data. For example, though Practo is a general purpose solution for doctors, they first picked dentists and later expanded to other segments. “Everybody is my customer” does not work. Give the target persona a name – say Molly/Tom/Rohan and write down as many attributes as you can about the persona – what is the annual salary, spending habits, attitude towards buying products similar to yours etc. This helps in identifying who is a target customer and who is not. This will also help in decision making – for example, if you want to add a feature – ask if Rohan will like that feature. And base your decision on the answer to this question. You can have multiple target personas once you become more mature. What if there are multiple people who are involved in the buying decision for the product? Who should you focus on? Your pitch should be to the buyer. You have to talk to the users and the influencers too, but the pitch must be to the buyer. With this background, it is time to introduce the six tenets of product branding. This is a concise summary of the discussion so far. You need to study and arrive at your understanding of the following six pillars. If even one of the above is not satisfied, you might not get the results. For example, one of the most common reasons for failure is that brands do not address the “Reason to Believe”. It is easy to make tall claims, but the consumers must clearly see the reason why they should believe your product’s differentiator. All the learning above are inputs to two tangible outcomes for your brand – (a) Brand Positioning Essence and (b) Brand Positioning Statement. “Brand Positioning Essence” typically consists of two to three words. It is that one aspiration of the core target audience that the brand would like to uniquely own. For example, “Feminity Restored” can be the essence for a soap targeting middle age women. Take a few minutes now to think about those two or three words that communicate the essence of your product. My product is a ________ (market dynamics) for ______ (target audience) who are ______ (consumer insights) and my product does _________ (key brand benefit) because ____ (reason to believe). Here is a shot at KeyMails brand positioning statement. I request other participants to write down their unique positioning statement for the benefit of the readers. For your reference, here is the silde deck used by Dhruv for the round table. Branding is a must for any product, whether it is in a mature stage or early stage. Particularly for product startups, the “brand” of the product is important. It is more challenging when the product is still evolving and the startup is trying to figure out the product-market fit and a minimum viable product. However, brand is in the mind of the customer and it is evolving. It can change with product market fit, but it has to be present at every time. You always need to have a differentiating factor that addresses a deep need for your target audience. And your brand positioning can and must change as you change product strategy. It is similar to your business model. It is not advisable to start building a product without having a business model and business plan. Sure, it will change and evolve over time – but at any point in time, you do have a business plan. Same thing with branding. If you’d like to share your knowledge on product branding, please do write them in the comments section. Branding is as important to startups as it is for mature products. Tweet this. Brand creates a promise. This needs to be delivered by the product. Otherwise, it will backfire badly. Tweet this. Thousands of things are going on inside the customer’s head. How do you get mindshare for your product? Tweet this. Even if you have a great product, if the customer cannot identify and recall it, you have lost the customer. Tweet this. Customer insights are at a deeper level and not just at the level of product benefits/features. Tweet this. Focus on only one thing in the customer’s mindshare. Without this, your brand will not have recall value. Tweet this. The best way to get consumer insights is by asking people who are using your product why they are using it. Tweet this. Ask your customer to describe your product. It can illuminate you on what you think your customer thinks. Tweet this. Go to market with the differentiating “hero” feature.Tweet this. Create a persona for your target customer. Give a name like Tom and write down Tom’s attitudes. Tweet this. Brand positioning essence is two or three words that you’d like to own in the customer’s mind. Tweet this. Create a brand positioning statement addressing the six tenets of product branding. Tweet this.